Instead of using freezer paper and then having to cut out the shapes with an exacto knife (what a pain) I used my mom's vinyl! It worked out great, and was a lot less work! When I was dyeing cloth diapers for burp cloths I threw in a few onesies as well with the hopes of someday trying out the freezer paper stenciling method. Today, I finally got around to it! I painted the flowers directly on the onesie. I painted "Ryann" on a piece of yellow fabric and then appliqued it onto the onesie. but I think it turned out pretty good. but there isn't much I can do about that! This is going to my cousin Suni who is having a baby girl in a few months! I lost my wallet in Hilton Head. So I made a new one. And it is exactly what I wanted. Small enough to fit in my back pocket. Big enough to fit a bank card, drivers liscense, recommend, and health insurance card. We used a beach town under our Christmas tree this year. A Mr. Bean beach towel. It looked ridiculous, but our Christmas tree skirt got ruined last year so we had nothing else to use. I got the fabric the day after Christmas at Joanns for 70% off! It took me quite a while to put it together, and then binding it (by hand) took even longer. But I did get it done before we took the Christmas tree down! I can't wait to use it next year! Todd bought me this book for Christmas. or if he just wanted an excuse for me to make cookies. Either way I thought it was awesome and couldn't wait to try it out. The book comes with a yummy recipe and lots of tips and tricks about how to roll out, chill (yes in that order), cut out, and then bake your cookies. Thanks goodness for parchment paper! It made the entire process 100 times easier. You actually make two different batches of frosting. One to pipe around the edges. One to flood the inside with. Their recipe calls for lemon juice and tastes great! Step Three would be to color the icing, but I didn't take a picture of that sorry. Use a #2 tip to pipe around the edges. I actually used a #3 because Kelsie was using my #2 and I think it would have been better with the 2. Clearly this was my first time. My piping skills are really lacking, to put it lightly! I've got to say this was probably my favorite part. I loved how the icing would just flow to the edges and would be perfectly smooth! Man, seeing my piping next to the super smooth center makes it stick out like a sore thumb haha! Next time I'm going to pipe with the same color I fill it with...does that make sense? After the flow frosting was somewhat dry I thought it was fun to go back and add polka dots, stripes, and other decorations. I really like how some of my butterflies turned out, but I think WES was my favorite! but really bad at blogging them. So here are a few of my most recent projects. A Christmas Wreath made out of ornaments and a hanger. I bought the Ornaments the day after Christmas for 50% off at Target. I'm still not happy with how the bow looks but I'll work on it next year. We ate these Christmas morning and they were awesome. I made this new headband with 3 flowers on the side. I found the tutorial for the flower Here. The entire headband probably took 10 minutes, and I LOVE it. The best part, I already had everything I needed. and some cute fabric but had never actually gotten around to making some. I had never dyed fabric before either and wanted to give it a shot. I decided to combine the two and absolutely love the results. on using it on lots of other projects! My friend Tasha requested this cake...and I'm so glad she did. I tried making it with just one cake mix, used tiny pyrex dishes for cake pans and then stacking it really tall. I wasn't too disappointed, the inside still looks awesome. fabric you can send it through the printer...but I'm so glad I did! I used the method to make these bags of Hot Coco for my neighbors and friends. I thought it made it look a lot nicer than the ziploc freezer bag I had inside. The Banana Cream Pie I made that is. Banana Cream Pie Recipie from this Lady on the Food Network. I recommend 1 1/2 the pudding recipe because 1 just didn't seem like enough. 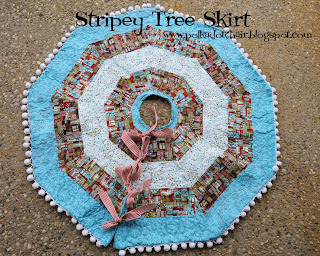 A stripy tree skirt from the Polka Dot Chair. It is a free pattern download. Hopefully I'll get it done in time for Christmas next year!